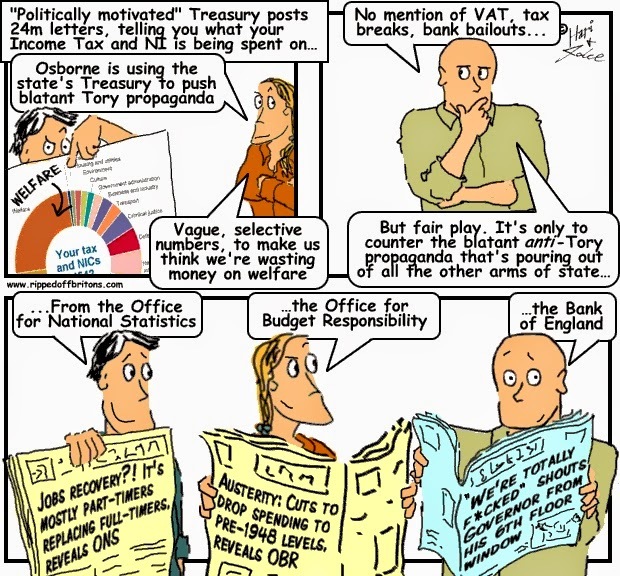 The treasury says that mailing out individual statements this week telling taxpayers what there money is being spent on is an act of transparency. But are the letters really that clear? SOURCE: The Office for National Statistic’s Labour Force Survey shows that the number of "full time employees" had not recovered since the 2008 banker induced crash. The 'jobs recovery' is made up mainly of part-time and self-employed jobs. SOURCE: The Office for Budget Responsibility, a body created by the government to provide independent economic forecasts, shows George Osborne’s current economic strategy will bring government consumption to the smallest share of GDP since before 1948 when the NHS was founded. SOURCE CITY AM: So much for talk of a 2014 rate hike - Mark Carney says he "expects spring 2015 interest rate rise"
Against his own predictions, the Bank of England governor, Mark Carney, has all but ruled out an interest rate hike this year. In a speech to the Trades Union Congress, he said inflation lower than the Bank's two per cent target, slack in the labour market and downward pressure from strong sterling mean the current inflation environment is "benign". This means no rate hike this year, but the governor thinks spring could be the time: “It [the inflation environment] will not remain benign if we do not increase interest rates prudently as the expansion progresses.” Carney warned that although the UK labour market has recovered, this performance has "come at a cost". He said: “The weakness of pay has, in effect, purchased more job creation. It has not resulted in an unusually high level of profits... The burden of the Great Recession has been shared across the UK. Profits have been squeezed almost as much as labour costs. Employees have seen their real incomes reduced, but more people are in work as a result.” The fall in real wages since the crisis is the greatest such drop since the 1920s. Bank of England governor Mark Carney told reporters that the housing market remained the "biggest threat" to Britain's recovery, insisting that the Bank's Financial Policy Committee (FPC) "could not control house prices". He said that the Bank was acting pre-emptively in a "graduated and proportionate" response and that lenders were "on notice". In an apparent reversal of his earlier predictions, Carney appeared to play down the prospect of imminent interest rate rises when he appeared before the Treasury Select Committee this week. Carney had indicated in his recent Mansion House speech that the first interest rate rise may come "sooner than markets currently expect", leading many observers to speculate it could arrive by the end of this year. Labour's Pat McFadden told him: "It strikes me the Bank is behaving a bit like an unreliable boyfriend - one day hot, one day cold - and the people on the other side of the message are left not really knowing where they stand." Why do both the Conservatives and Labour push so hard for cuts to taxes and public spending when the British Social Attitudes Survey shows only 1 in 10 Brits want this? Richard Murphy does a lot of excellent stuff. We thoroughly recommend his material, and his pugnacious nature!. THERE IS A USE FOR IT LIKE THE DAILY FAIL IT WILL DOUBTLESS BE VERY ABSORBANT WH0 NEEDS ANDREX? Letter from Sir Andrew Dilnot, boss of the UK Statistics Authority, confirms that the 'welfare' segment of the pie chart "includes the main public sector pensions (for example, armed forces, civil service, Royal Mail, and teachers)". In order to inflame the public debate by exaggerating the welfare spend, the government would have us think the pensions earned during the careers of retired soldiers, civil servants, and teachers are 'welfare'.